Program Anti-slide pile performs analysis of anti-slide piles (calculation of internal forces + displacement, dimensioning of pile cross-section). The analysis of structure is almost the same as in the program "Sheeting check", the different is determination of pressures above the slip surface and possibility to model pile fixed into the rock. If there is for an input slope or structure found an unacceptable slip surface, then it is possible to increase the slope stability on this surface by inserting an anti-slide pile ("Anti-Slide piles" frame serves to perform this step in the "Slope stability" program). The pile has to be placed such that it crosses the slip surface and its base is found sufficiently deep below the assumed slip surface. 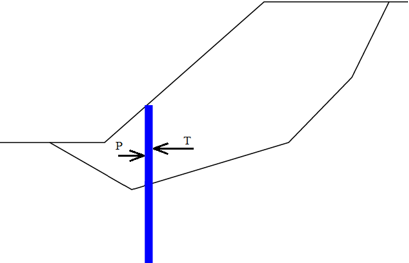 Above the slip surface the pile is loaded by an active force T having tendency to shift the pile and by a passive (resisting) force P stabilizing the pile (see figure below). The difference between the passive and active forces creates a load that must be transfered by the pile to increase stability on a input slip surface up to required value of SFs. If the slope stability SF without an anti-slide pile is not sufficient, the active and passive forces are in equilibrium - the pile is not loaded and there is no need to use it. For calculation of forces acting on a pile it is thus important that the required factor of safety SFs is greater than the one calculated for a given slip surface SF without a pile, or the required safety is larger than the one associated with a input slip surface in the absence of an anti-slide pile.